Tagged under Kiyohiko Azuma, J.C. Staff, Series. Azumanga Daioh is a slice of life anime that follows six friends throughout their three years of high school. 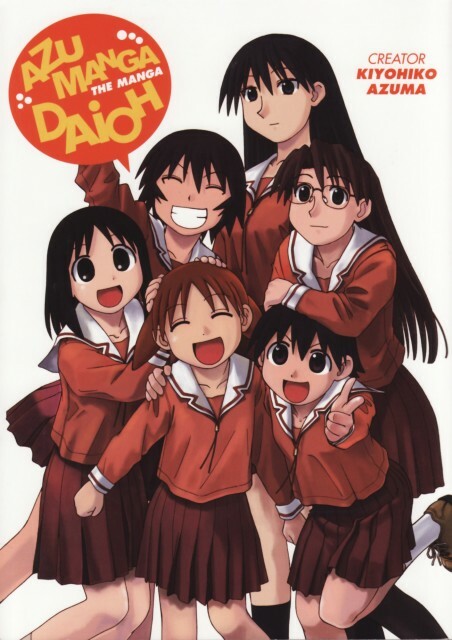 There is no overarching plot other than following the experiences of these six characters through high school; however, Azumanga Daioh still succeeds on its strong cast of characters and their interactions. The main characters are all female, and the friends - and their teachers - get into some very interesting and hilarious situations. They are: Tomo, the energetic one with no self control, Yomi, Tomo's... "friend" through all their school years, Chiyo, the 10 year old genius, Osaka, the airhead, Sakaki, the tall, athletic and shy one with a thing for cats, and Kagura, the athlete and self-proclaimed rival of Sakaki. As said before, this show brings very little new to the genre. However, it makes a good use of the one-shot theme and manages to build a strong line it follows- even when there's no clear "goal" in the episodes. The episodes are different from each other but there is a lot of repetitive stuff; the girls spend their time mostly at school. Towards the end we get to see more deeper relationships and even some new settings but sometimes I feel like there should be more places to spend freetime than Chiyo's gorgeous home (or summerhouse). My favourite episodes are in the end when emotions are shown more freely and conversations get deeper. The humor never disappears though and it makes me smile in every episode. Azumanga Daioh is the classic slice of life comedy and really set forth the motion towards the "cute girls doing cute things" trend that hit so hard in the mid to late 2000's. The characters were classic with some hilarious scenes and good mixture of scenes. There were many typical anime tropes and all of them were great. This isn't for everyone and it's not the best in my opinion within this genre but it's a must watch if you like slice of life comedies. The anime is just about the high school life of a group of girls. The anime might seem pretty typical with a cute smart girl, a quite girl , sporty girls and the ones not very bright. But its not typical at all, its one of a kind! XD Definitely a good watch. The reason I started reading the manga was because I needed a manga to read to pass time. Originally the whole School girl anime doesn't appeal to me much but this was actually satisfying. Even though this doesn't make some people laugh it sure makes me laugh D: yeah peoples sense of humor may vary. great fun! story about everyday school life and how characters grow up throughout the time frame in anime. literally no male characters but very enjoyable, won't category it as a girly anime. thanks for the vastly different characters in story. their characteristics are very well highlighted through events and became backbone of laugh points. seiyuu gave solid performance. osaka in particular. very impressive. This series is always great for a laugh... my go-to feel-good anime! I watched the first episode at 3 am and it was the funniest most random thing ever! Great slice of life, kooky, comedy. Each character has her own unique personality and they all work well together somehow. There are some great AMVs out there for this series! I've watched the first 16 episodes, and it's supposed to be funny, but it's only gotten 10 laughs out of me. I ranked it a 5 because I haven't finished the series, so a final score can't be determined, however if it continues on like this, then It won't get above a 4 (and more likely be ranked a 3.5). It also moves really slow. The characters have distinct personalities but I just cant relate to any of them, and the plot is super weak. I recently started this series in an attempt to clean up the list of partially watched series. Absolutely boring. This series has no plot. I'm going to give it a poor ranking before even finishing it. Update:: first 17 episodes. When is this series going to end, it's painful to watch. Docking another .5 of a point for being so long, because 12 episodes was bad enough, but this series... it never seems to end. On the upside I'm more than halfway through, just 9 more to go... oh man... there's so many left! When will it ever end! Okay who doesn't like totally random, funny things. Well if you don't then you better start, because this anime is all over it. Its about how crazy life is in high school due to weird students, little kids and the ditsy Teacher. I wont ruin it for ya but the adventures are amazingly LOL. So sit down and let this life blow you away. Azumanga Daioh is not something many can tolerate. It is one of the best experiences of those cute scenes in most animes, but with endless crazy scenes. Most of the jokes requires japanese explanations, because they mix words and there is the funny thing about it. I like the most to watch anime in original japanese (with subtitles of course) but this one is only for cute people. Delightful, although too sweet maybe. Almost done with this series, I'VE LOVED IT SO MUCH. Such lovable characters, and its had me rolling on the floor with laughter. Also, the cuteness that is Chiyo-Chan never fades. You just never get over how cute she is.